From the same person whose saddle I previously posted here, this one is his latest creation, another beauty. When they are not used to being together in such a close proximity, some horses are just too unhappy that the others are invading their space. This morning was such a case, when my older son was riding with a friend. Being a beginner, I am quite pleased that he was not panic, and most importantly, he stayed on the horse’s back and continued. The best part after horse riding lesson is when you can take your horse for a walk. 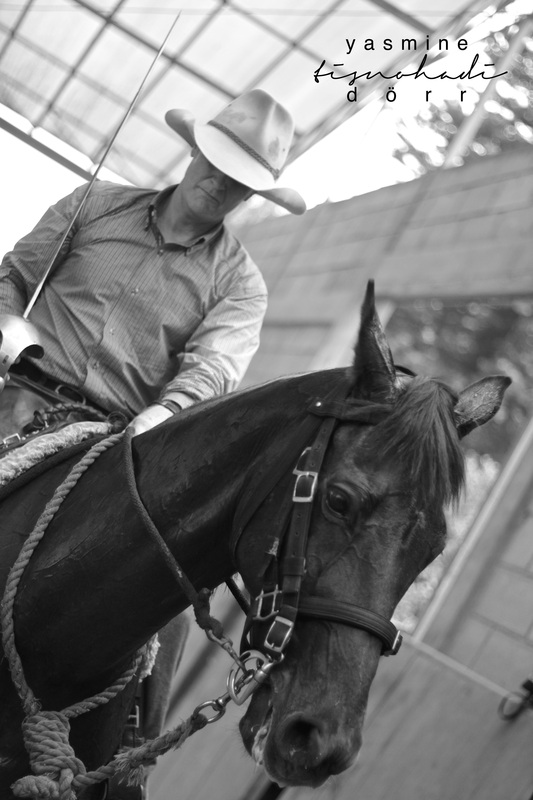 Western riding is something relatively new for my husband, but he got a hang of it quite fast I must say. From distance, I watched how this man rode his horse. Living in Jakarta, it’s quite unusual to see people ride western. So for me personally, it was quite a show. Later on as we chatted, I found out that this very lively Australian guy, whose first job when he was young was to break horses, now makes saddles as a hobby! Beautiful saddles with intricate design. I wish I can see his collections and take pictures of all. It was a very hot day and I was standing underneath a tree to protect myself from direct sun. Using the leaves as framing, I managed to shoot a coach training his horse. We have all forgotten how strange a thing it is, that so huge and powerful and intelligent an animal as a horse, should allow another and far more feeble animal, to ride upon its back – Peter Gray.